The noise from a plane is caused by two things: by air going over its fuselage and wings (or ‘airframe’) and by the engines. Engine noise is created by the sound from the moving parts of the engine, and also by the air being expelled at high speed once it has passed through the engine. Most of the engine noise comes from the exhaust or jet behind the engine as it mixes with the air around it. Aircraft today are much quieter than they were 40, 30 or even 20 years ago. And these will be replaced by even quieter aircraft in the future. But, of course, even though each individual aircraft is quieter, there are more planes flying today. This means that the average level of noise is lower than before, but you may hear individual planes more often. The airfield was first established over 100 years ago by the Royal Flying Corps during World War I. The airport was officially opened as a municipal airport in 1935. In 1939, the Air Ministry requisitioned the airfield and it was known as RAF Rochford during World War II when it became a base for fighter squadrons comprising Supermarine Spitfires and Hawker Hurricanes as well as Bristol Blenheims. The number of flights and type of aircraft using London Southend Airport throughout its long history has varied greatly. In the 1960’s and 1970’s London Southend Airport was the third busiest airport in the UK, offering scheduled passenger flights to Europe using Carvair aircraft which passengers could drive their cars into, and in the 1980’s London Southend Airport was handling over 100,000 aircraft movements each year. Whilst passenger services declined in the 1990’s the airport did remain a major hub for maintenance companies, with large aircraft – such as the B727 and BAC1-11 being regularly maintained at London Southend Airport. In 1993, after the airport had been making losses for many years, Southend Borough Council sold the airport to Regional Airports Ltd (RAL), who set about turning the airport into a profitable business and got planning permission for a new rail station to be added to the London Liverpool Street line, which would enable future development of the site. In December 2008, the airport was sold to the Stobart Group who then sought planning permission to extend the usable runway length by 300m to 1,799m and upgrade navigational and lighting aids. Planning permission for the runway extension was granted 20 January 2010. The runway extension, opened in 2012 allowed for the airport to increase the range of destinations offered beyond the scheduled passenger services to Ireland and the Channel Islands. As a result of planning permission being granted for the 300m runway extension in 2010, a Section 106 agreement was entered into between the airport and local councils. A number of new controls and incentives were agreed and introduced to help minimise any negative impact on the surrounding communities that the airport development might bring. Download a summary of the operational controls which were agreed by Rochford District Council, Southend-on-Sea Borough Council and London Southend Airport. This is also available on the Southend-on-Sea Borough Council website. Passenger flights can only be scheduled between 06:30 to 23:30 (limited quota between 23:00 – 23:30) however delayed and diverted passenger flights may still operate. As has always been the case, freight, business, hospital, positioning and other types of flights can operate during the night. These flights are not listed on our arrivals and departure boards as they are not relative to passengers. Aircraft classifications can be found on the NATs website. The direction that aircraft take off or land generally depends on the wind direction. For performance and safety reasons, aircraft will take off and land into wind. Due to prevailing south west winds, around 70% of aircraft movements arrive from the North East (over Burnham-on-Crouch/Rochford) and depart to the South West (over Leigh on Sea). When the wind is calm the direction of runway is determined by the wind direction at between 1000ft and 3000ft. On the unusual occasion that the wind is light and variable at 3000ft, several factors are taken into consideration when determining which runway direction to use, including the most appropriate approach routing for arrivals, the weather, and the current air traffic in airspace around the airport. During the night period – when weather and safety conditions allow – London Southend Airport is committed to operate all aircraft movements from and to the north east (over Rochford) as this is a much less densely populated area than that to the south west of the airport. During the daytime – when weather and safety conditions allow and movement volumes allow the runway direction to be changed – London Southend Airport agreed to ensure that more than 50% of aircraft operations occur to and from the north east of the airfield over Rochford. The airport’s performance against this scheme is reported in Section 8 of its Annual Report. To minimise the number of local residents being overflown by departing aircraft, noise preferential routes were introduced as a condition of the S106 planning agreement (2010). This means that all aircraft weighing over 5700kg must follow a straight departure heading for 2.5 nautical miles when departing towards the south west (over Leigh-on-Sea) and 1 nautical mile when departing towards the north east (over Rochford). This ensures that within the surrounding areas, departing passenger aircraft will only overfly those residents already living under the arrival path to the airport. Once aircraft have cleared the designated NPR zone and reached a height of more than 1,500ft, Air Traffic Control (ATC) can instruct the pilots to fly a more direct heading towards their destination – this is known as ‘vectoring’. However, ATC may direct aircraft off the NPR at any time if this is required for safe separation from other aircraft or for other safety issues (such as avoiding adverse weather). Track keeping is taken very seriously and it is closely monitored and logged by our dedicated system. One factor that does affect the way aircraft noise is perceived is the atmospheric conditions at the time of the flight. If we experience calm atmospheric conditions usually associated with warmer weather, sound waves will travel further and as such, it is perceived that the noise is greater. In more turbulent conditions associated with wind and rain, sound waves get dispersed and thus making aircraft appear quieter. It’s a similar scenario to dropping a pebble in a pond; the ripples travel further if the water is still. If you introduce waves, the ripples are dispersed more quickly so travel less distance. Low clouds also have an insulating effect on aircraft noise. This is another reason why on a cloudless day, the noise seems greater. During strong wind conditions, it has been shown that sound waves can be carried for large distances. This means that aircraft taxiing on the ground at Southend can be heard some distance away from the airport in a similar manner to road noise. During the night, when background noise is far lower, the sound of an aircraft taxiing may carry even further. In accordance with the terms of the Environmental Noise (England) Regulations 2006, Southend Airport submitted a revised Noise Action Plan to DEFRA on 29/11/18. A formal letter of Adoption was received 13/2/19. In line with DEFRA guidelines the revised adopted Noise Action Plan has been published on our website with 28 days of adoption. You can download the Noise Action Plan here. There have not been any changes to the final approach flight path as a result of airport development or increased passenger fights. Burnham on Crouch is located approx. 6.6 miles from the airport and sits directly under the extended runway centreline meaning that, when the wind is south westerly (approx. 70% of the time) arriving aircraft will overfly the town centre at a fairly consistent height of between approx. 1,800ft – 2,000ft, making use of the Instrument Landing System (ILS) which ensures a safe and accurate final approach at a fixed glide path of 3 degrees At this stage of the approach (approx. 5-8 miles out) the wing flaps may be adjusted and the landing gear will be lowered to help slow the descent, this will alter the air flow over the aircraft frame which can create variations in the level of aircraft noise. Rochford is located directly North East of the runway and encompasses some of the airport boundary. Aircraft arriving on runway 23 will pass over Rochford as they make their way down to the runway. The only changes to the initial departure route in recent years has been to adopt a noise preferential route in accordance with our S106 planning agreement (2010). Aircraft departing on runway 05 towards the North East must maintain a straight departure heading for at least 1 mile and reach 1,500ft before they may turn. This reduces the number of residential properties overflown in Rochford. Departing aircraft will gain lift as quickly as possible and will therefore always be higher than arriving aircraft in the same location. The tone of sound from a departing aircraft may however seem louder, depending on where you are in relation to the initial departure sequence, as the engines are working harder on departure than arrival. When runway 05 is in use (winds are North Easterly) many of the aircraft will turn towards their destination before reaching Burnham on Crouch. Only aircraft that are vectored towards Clacton for European countries such as Holland, Germany, Belgium will overfly Burnham on Crouch, where they should be at a height of approx. 2,500ft - 3,000ft. The only changes to the final approach path in recent years has been to increase the ILS fixed glide path to 3.5 degrees from 3 degrees. 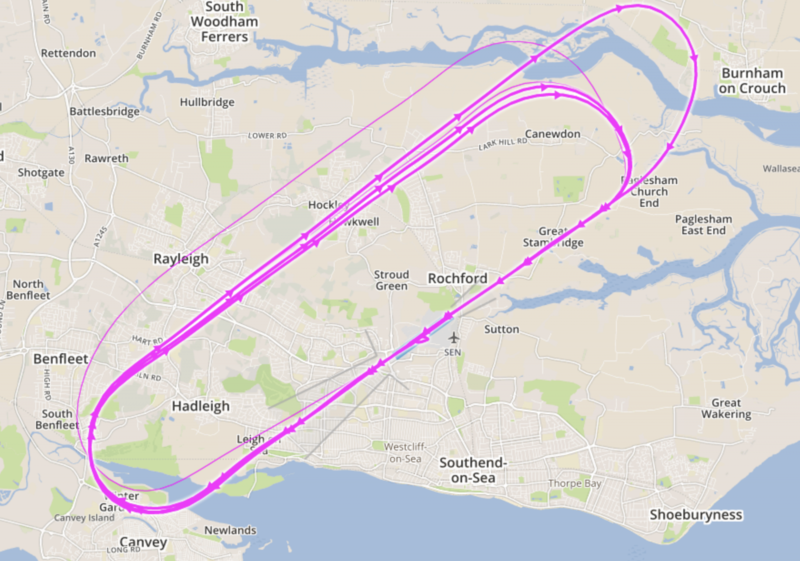 This increases the height of aircraft making an ILS approach, as they overfly Canvey Island and Leigh on Sea. Canvey Island is located approx. 6 miles from the airport and sits directly under the extended runway centreline meaning that, when the wind is North Easterly (approx. 30% of the time) arriving aircraft will overfly the town centre at a fairly consistent height of between approx. 1,500ft – 1,800ft, making use of the Instrument Landing System (ILS) which ensures a safe and accurate final approach at a fixed glide path of 3.5 degrees. (The ILS is fixed slightly higher on runway 05). At this stage of the approach (approx. 5-8 miles out) the wing flaps may be adjusted, and the landing gear will be lowered to help slow the descent, this will alter the air flow over the aircraft frame which can create variations in the level of aircraft noise. Leigh on Sea lies directly to the South West of the airport and sits directly under the extended runway centreline meaning that, when the wind is North Easterly (approx. 30% of the time) arriving aircraft will overfly the town at approx. 1,000ft from 3 miles out, and will continue to descend down to the runway. The only changes to the initial departure route in recent years has been to adopt a noise preferential route in accordance with our S106 planning agreement (2010). Aircraft departing on runway 23 towards the South West must maintain a straight departure heading for at least 2.5 miles and reach 1,500ft before they may turn. 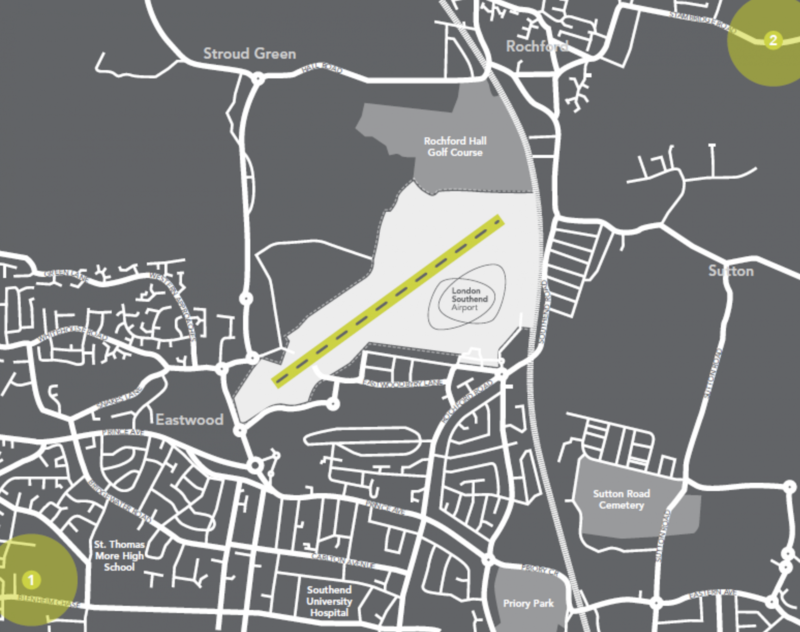 This reduces the number of residential properties overflown in Chalkwell, Eastwood, Westcliff and other residential areas to the north and south of the extended runway centreline. When runway 23 is in use (winds are South Westerly) many of the aircraft will turn towards their destination before reaching Canvey Island town centre. 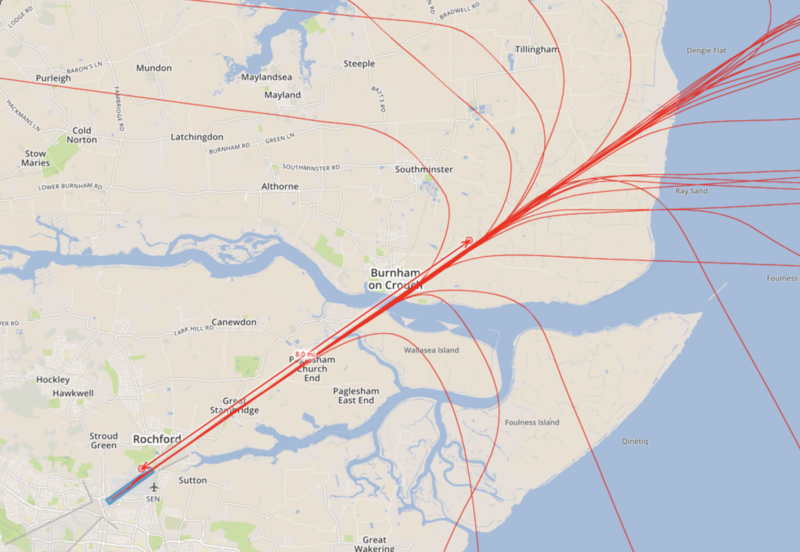 The precise height of departing aircraft over Leigh on Sea will vary according to your distance from the airport and extended runway centreline, aircraft type (performance capabilities), weight (including number of passengers) and weather conditions. All aircraft above 5700kg will be at a height of at least 1,500ft as they pass over Hadleigh Road (2.5 miles from the airport). The ILS utilises three radio beams which are emitted from ground based infrastructure located within the airport boundary. One beam ensures that the aircraft is aligned with the runway centreline, one creates a “glide path” for aircraft to follow to allow them to descend at the correct speed and angle and one gives distance away from touch down. This system works in conjunction with specialist systems on board the aircraft and allows for a consistent flight path. The ILS approach is used for all arrivals during low visibility and low cloud and is classed as a precision approach. A visual approach is where pilots position the aircraft to land by using a visual reference to the airfield. The pilot will manually fly the aircraft and will align with the runway using a combination of visual referencing and various lighting systems that are on the ground at the airport. A visual approach can only be flown when visibility is good and when the clouds are above a certain height. The flight path over the ground for a visual approach can vary. The noise from planes is measured for many reasons. It is important to understand the impact on our local communities and to know whether the noise levels are increasing or decreasing over time. In the UK, noise measurements are evaluated using the average noise level during the day (a 16-hour day) during the summer period. The measure of noise is given in decibels (dB). This averaged decibel measurement ‘LAeq’, is the most common international measure of aircraft noise, it means ‘equivalent continuous noise level’. The latest noise contour maps are published in the Annual Report. The noise contours are reviewed every two years and all qualifying properties falling within the contours will be notified if they qualify for the Property Acquisition or Sound and Thermal Insulation Grant Scheme (see FAQs below for more information). Through the Airport Consultative Committee which meets each quarter, the Airport maintains a close working relationship with representatives of local authorities, community groups and airport users. It is a statutory committee set up under Section 35 of the Civil Aviation Act 1982 (as amended) and has no executive powers. Issues discussed by the Committee include employment opportunities; training; new investment and environmental management together with recommendations for the airport company to consider and progress including on the community use of any fines imposed for violations of the Airport’s Noise Preferential Routes. Download The Constitution of the Consultative Committee list of those organisations represented. Please note that members of the public may be allowed by invitation to attend the section scheduled at the start of each meeting to ask and receive answers to questions. The questions must be submitted in writing to the Airport at least 2 weeks in advance of the date of the meeting. The questioners will only attend for the part of the section of the meeting during which their question is being considered. Issues discussed include employment opportunities; training; new investment and environmental management together with recommendations for the airport company to consider and progress. Airport Consultative Committee Meeting Minutes. Consultative Committee meeting minutes are available for download from our website on the Community reporting page. Annual reports are available for download from out website on the Community reporting page. Firstly, we always recommend that you spend some time in the area to gain an understanding of where aircraft fly in the vicinity. It is best to pick different times over a number of different days so you can understand how the schedule and routes can vary. We also encourage you to get in touch with us so we can give you an accurate picture of flight paths and any more information to better inform your decisions. Your estate agent should be able to put you in touch with the seller of the property to discuss their experiences but please remember that noise is subjective, what affects one may not affect another. For further information, please email our Noise Manager at lsaenquiries@southendairport.com. What happens when an aircraft does not follow the noise preferred routes? There are occasions where aircraft are instructed by Southend Air Traffic Control (ATC) not to follow the noise preferred routes, usually due to weather conditions or other safety reasons. However, if an aircraft deviates for no reason, a full investigation will be carried out in conjunction with the aircraft operator. In the first instance, we request a thorough investigation as to the cause of the breach to determine whether it was due to any mitigating circumstances such as weather or aircraft avoidance. If it is established that pilot error is the primary cause, a formal infringement notice is issued. Steps are taken to ensure that the operator concerned has all of the correct noise abatement controls to ensure no further breaches occur; however, if they continue to breach then automatic fines are issued. The London Southend Airport Consultative Committee are responsible for reviewing all infringements and they decide which local charitable causes should benefit from any fines collected. 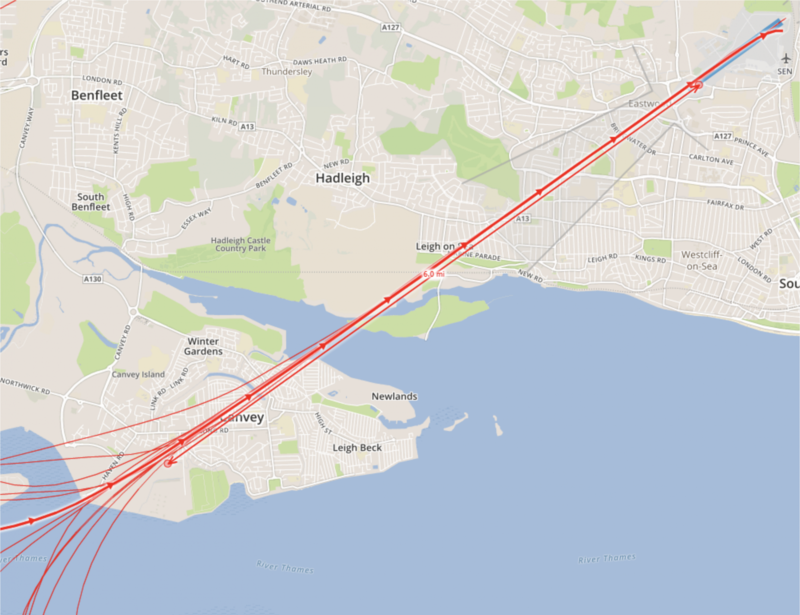 I live in Thorpe Bay/Shoeburyness – Why do I hear aircraft in my area? Aircraft will only depart over Thorpe Bay/Shoeburyness when the wind direction is north easterly (approx. 30% of the time) and they are routing towards a destination in Southern Europe. As there can be quite lengthy periods of time when departures are operating over Leigh on Sea due to the prevailing wind conditions, residents to the east/east west of the airport may assume that this is the ‘correct’/’usual’ departure pattern and can be alarmed/surprised when they notice aircraft in their location. Aircraft will always fly the safest and expeditious route toward their destination – meaning that they are carefully positioned with consideration for other conflicting air traffic and provided the quickest route to gain height into the upper controlled airspace. Since the introduction of the London Airspace Management Programme (LAMP) Phase 1A, in February 2016, London City arrivals have been routed further south of the airport, along the Thames Estuary. 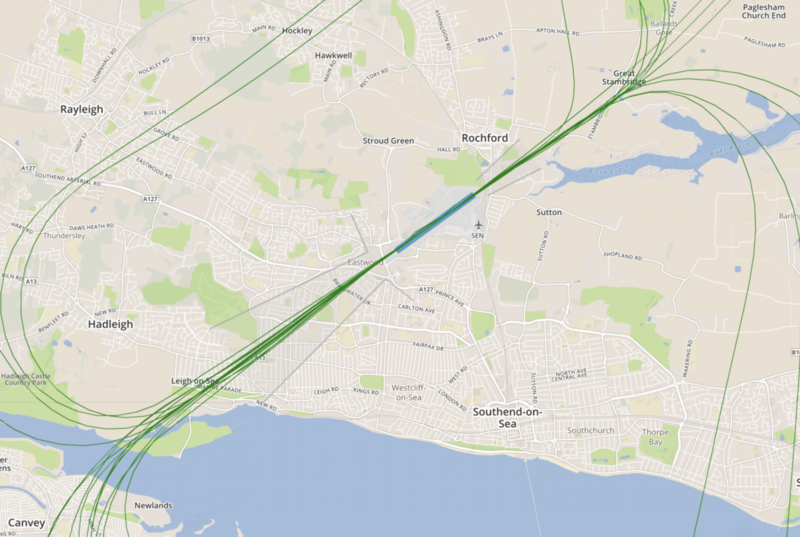 As a result, Southend departures must remain below the overhead air traffic at 3,000ft. Further information on LAMP can be found at on the NATs website and CAA website. Activity: Live Firing / Unmanned Aircraft Operations. Hours: Mon-Fri 0830-1800 Winter (Summer 1hr earlier) and when notified. Further information on the Qinetiq website. The no fly restriction zone map can be found in the UK AIP. Aircraft conflicting with arriving aircraft from the north east of the airport and air traffic from other airports. Aircraft being positioned incorrectly to connect to the upper controlled airspace network. Increased workload for controllers and flight crew. I live in Hockley/Rayleigh – Why do I hear aircraft in my area? Hockley and Rayleigh fall within the Class D controlled airspace associated with Southend Airport therefore aircraft may be positioned and/or routed overhead. The precise positioning will depend on a number of factors including where control of the aircraft is handed over to Southend ATC from the upper controlled airspace. Aircraft on final approach to Southend from destinations to the North or East of the airport that are required to land on runway 05 will be routed to the north of the airfield over Hockley/Rayleigh in order to turn and come back around to line up with runway 05 from 5-8 miles out. Since the introduction of the London Airspace Management Programme (LAMP) Phase 1A, in February 2016, London City arrivals have been routed further south of the airport, along the Thames Estuary. As a result, Southend arrivals are usually routed north of the airfield to avoid conflicting air traffic and the No Fly Zone at the MOD site in Shoeburyness when it is declared active. Further information on LAMP can be found on the NATs website and CAA website. I live in Kent – Why do I hear aircraft in my area? Aircraft operating over your location will not be under the direct control of Southend Air Traffic Controllers. Aircraft departing Southend will be passed to Thames Radar as they approach 3,000ft and are transferred into the upper controlled airspace. Arriving aircraft will be directed by Thames Radar until they are closer to Southend (the direct position of the hand over will depend on overhead traffic and how busy the surrounding airspace is. A major review of the airspace in the south east (London Airspace Management Program (LAMP) Phase 1A) was carried out in 2015 – further information about his can be found on the CAA website. The proposed Southend departure routes were required to be integrated with the much wider LAMP project. Since the implementation of LAMP in early 2015, the result has been that Southend departures are now routed slightly further east over Kent. You may also notice London City (LCY) air traffic which is also now routed over your area as a result of the LAMP changes. The airspace in the south east of the UK is some of the most congested in the world and Kent has always been overflown by aircraft using London airports. The changes implemented under LAMP have improved operational efficiency and environmental performance, helping to minimise delays and deliver safety benefits. Why do British Airways use Southend Airport for crew training? As you would expect, pilots must be competent in all types of aircraft operations/arrival procedures and are required to carry out specific training exercises to ensure that high safety standards are maintained. Due to feedback from local residents in 2017 when BA carried out a number of training exercises at weekends, the training circuits have been varied to reduce the level of noise disturbance over specific areas. (More often than not, circuits are operated to the north of the airport). Wherever possible, the height and direction of the circuits is also varied. Furthermore, London Southend Airport has been working with BA to reduce the amount of training at weekends and to encourage training during the weekdays when it goes fairly unnoticed by local residents. Whilst we can do whatever we can to minimise disturbance from this type of training, we cannot eliminate it completely as specific elements are essential and training needs to be conducted when crews and aircraft are available to the airline concerned. The circuits are generally taken north of the airport as it’s easier for our ATC to maintain a visual on the aircraft during some specific types of training, and there are sometimes no-fly restrictions to the south east over the MOD site at Shoeburyness. 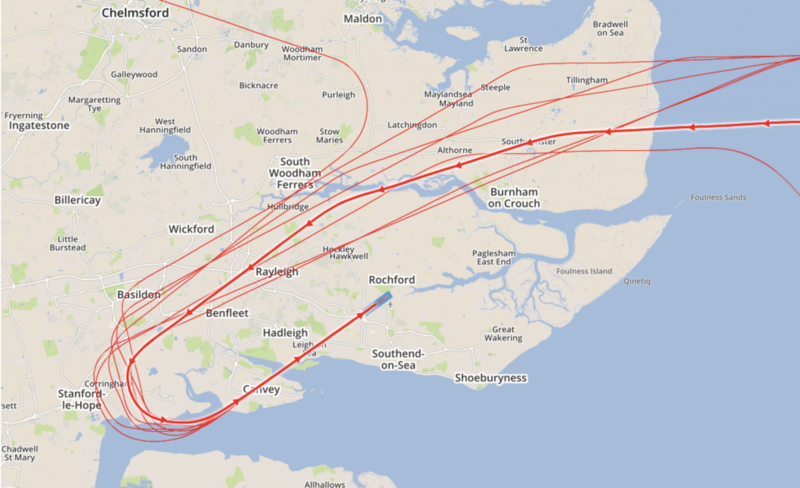 In addition to British Airways, other operators and flying clubs may use Southend for training. The airspace in the south east of the UK is one of the most congested in the world and there is a demand for pilots to be trained in light aircraft before progressing to the larger passenger jets. Pilots must be trained in specific aspect of flying and that they must learn to use different airfields during their training (part of the syllabus defined by the CAA). This also includes landing practice that requires the use of the visual circuit to position the aircraft in a safe manner. There are a limited number of airfields left to accommodate this type of training and Southend ATC do not have the authority to place additional restrictions on aircraft operators other than those agreed within the S106 planning Agreement (2010). Training of this nature is fully compliant with our S106 planning controls as well as any related CAA safety requirements and still makes up a very small percentage of our overall movements. The airport is not obligated to publish advance notifications of planned training events, however the airport does try to provide advance notification via social media/website, the Airport Consultative Committee and some local councillors. 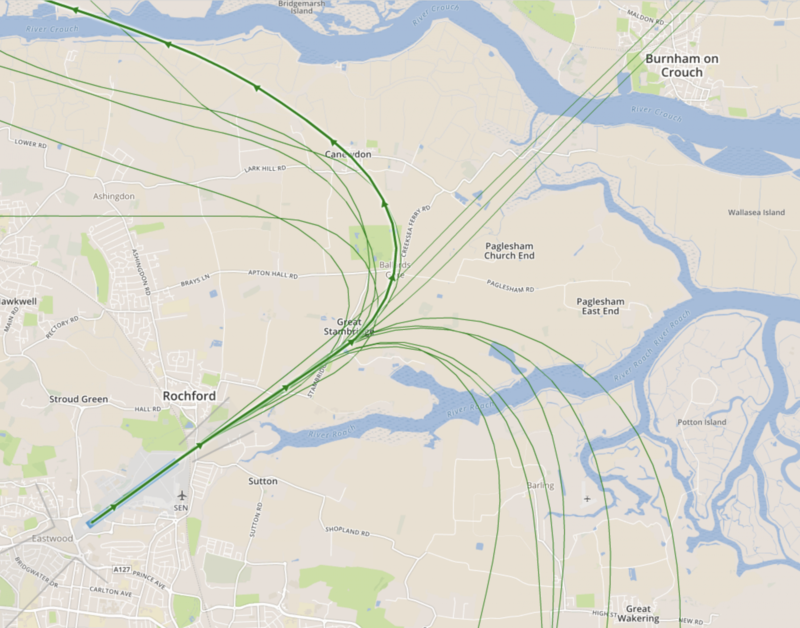 I live very close to the airport – why do I hear aircraft noise when there are no flights? We know that it’s not just aircraft in the air that can be disturbing; aircraft on the ground can cause disturbance too and we are working to reduce this as much as possible. Testing (ground running) of aircraft engines One of the airport’s main operators – Stobart Air – uses the technique of single engine taxiing at London Southend Airport reducing ground noise and NO2 emissions. The other main operator – easyJet – have a policy of utilising single engine taxi for both arrivals and departures, where possible this process is utilised however it is not necessarily utilised 100% of the time due to the relatively short distance from stand to runway. To ensure that the use of diesel fuelled Ground Power Unit’s (GPU’s) and aircraft Auxiliary Power Units (APU’s) are kept to a minimum, almost all new aircraft stands are fitted with Fixed Electrical Ground Power (FEGP). Engine testing may be required from time to time. Whilst Southend no longer support a large maintenance overhaul operation (MRO) some of our based aircraft may have to undergo routine check and on-line maintenance. The airport ensures that all engine testing is carried out in accordance with our Engine Testing Best Practice Plan which stipulates the location of the testing site and the permitted testing times. Bird Scaring is an essential part of maintaining a safe airfield. The type of bird scaring method used depends on the type of bird and their nesting/feeding habits. Before releasing flares or firing a gun, alternative bird scaring methods are used; the Wildlife Controller will initially drive a vehicle along the runway and use a speaker to emit distressed bird sounds to try and disperse the birds, they will also pull up and get out of the vehicle to try and scare the birds away. If these methods have little or no effect, then the gun or flares will be used. We usually find that the larger birds such as gulls or crows can be more stubborn than most. Being a coastal town, gulls can be a particular problem at certain times of the year and they tend to come inland to find food when the seas are rough. Once gulls land or find food they are very difficult to disperse so flares will be fired as soon as the gulls are identified over the airfield. It is essential to keep the airfield clear prior to any departures or arrivals. The safety of passengers and those living under the flight path is paramount. We were told that London Southend Airport would only operate ‘Whisper Jets’ once the runway was extended, why can I still hear noisy jets? The term ‘Whisper Jet’ was an aviation name for the old Bae 146 and RJ85’s. Admittedly, the term ‘Whisper Jet’ implies a very quiet aircraft, (and certainly at the time these aircraft were a lot quieter than the old B727’s BAC 111’s etc.) however, it is slightly misleading as this term is now quite dated and aircraft have evolved a lot since then. The more modern Embraer’s, Airbus 319’s and A320’s that are currently based at Southend are much newer and quieter than ‘Whisper Jets’. What time is the first passenger departure? Passenger flights may be scheduled to depart from 06:30. The airline (and Flight Information Display (FID) screens) may advertise a slightly earlier departure time than 06:30 to allow for the aircraft to be boarded and pushed back from stand, however Southend ATC will not allow any passenger aircraft to depart the runway prior to 06:30. Based aircraft will usually be scheduled to fly up to three different destinations per day which is why they will all depart soon after 06:30, then will then be a fairly quiet period until the first wave of aircraft start to return to Southend. Departures will then be staggered for the rest of the day as destination distances vary. What time does the last passenger flight arrive? Passenger flights may be scheduled to arrive up until 23:30 (with restriction on the number than can be scheduled between 23:00 – 23:03 – please refer to the Operational Controls Summary (link). Aircraft that are scheduled before 23:30 may occasionally be delayed due to circumstances beyond the airports control e.g. bad weather (fog/snow/storm), Air Traffic Control industrial action, technical faults, delays at the destination airport. Delayed aircraft are permitted to return to the airport during the agreed night time period. Both the airport and the airlines work very hard to avoid delays. As well as wanting to provide a great customer service and avoid late flights, any delays are very costly with regard to compensation claims, staffing costs and onward travel arrangements. I heard a helicopter operating at night aren’t they banned? Private helicopters are banned at night. Helicopters operated by the Police, HM Customs, Coastguard, Military and Air Ambulance are exempt from the ban, in accordance with the S106 Planning Agreement. The true definition of Airspace is the portion of the atmosphere controlled by a country above its territory, including its territorial waters or, more generally, any specific three-dimensional portion of the atmosphere. The airspace over Southend Airport is classed as controlled airspace. Controlled airspace exists where it is deemed necessary that air traffic control has some form of positive executive control over aircraft flying in that area. This is for the safe passage of commercial aircraft and is for the safety of passengers on board the flight. Air Traffic Control will sequence flights within controlled airspace to ensure that strict separation is maintained, both laterally and horizontally between aircraft. An aircraft can maneuver anywhere within an area of controlled airspace. The following links to the NATs and CAA websites may be helpful in explaining how the airspace is managed. How does the airport measure aircraft noise levels? Most airports have noise and track keeping systems which take radar data from air traffic control and combine it with flight information such as a call sign, tail number, type and destination. London Southend Airport is no exception. 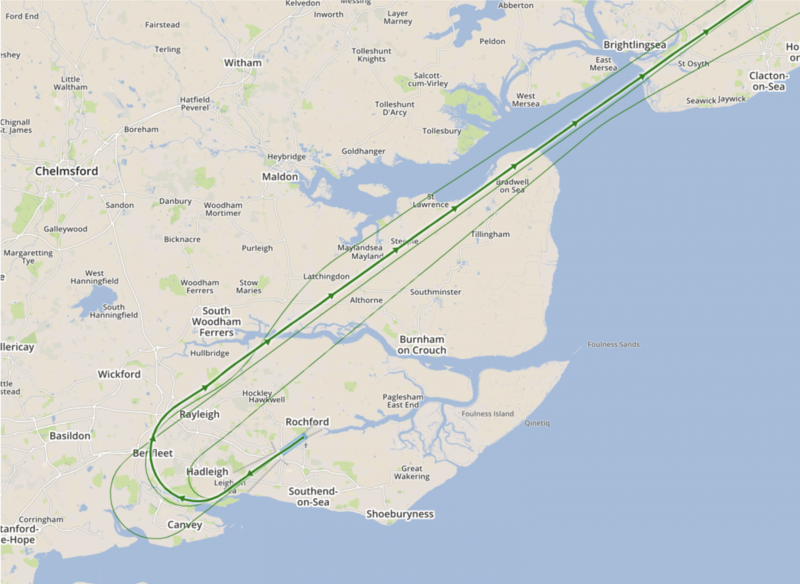 London Southend Airport operates a Noise and Track Keeping System that captures data from two fixed noise monitors which are located approximately one mile from each end of the single runway – as shown on the map below. Please ensure that your letter includes your full name, address and a contact number as well as details of the aircraft/flight you wish to complain about i.e. date, time, and the nature of your enquiry/complaint. Our aim is to respond in writing to all noise comments within 7 working days. Once the data relating to the complaint has been recorded, it will be investigated. The investigation will be processed through the Noise Desk system and may involve further actions as necessary to establish the circumstances of the flight. If further information is needed the person making the complaint will be requested to provide more information / specific details so the investigation can continue. Once the investigation is complete the findings will be recorded in the database, including, if necessary, a summary of any conversation / correspondence with the person making the complaints. Once fully investigated, a written response will be sent explaining the event which created the noise incident and will conclude whether the identified aircraft was operating to standard procedures, with the airports operating conditions. The response will ask for the person making the noise complaint to respond within 10 days if they are dissatisfied otherwise the matter will be filed. The appointed noise manager will continue to investigate any further comments on the matter however if after further investigation and further response the person making the noise comment remains dissatisfied the matter will be referred to the Airport Consultative Committee for further consideration. All data relating to noise complaints is collated monthly and shared with the local councils and Airport Consultative Committee. A summary of all noise complaints is provided within the airports Annual Report. What is the point of complaining about aircraft noise? 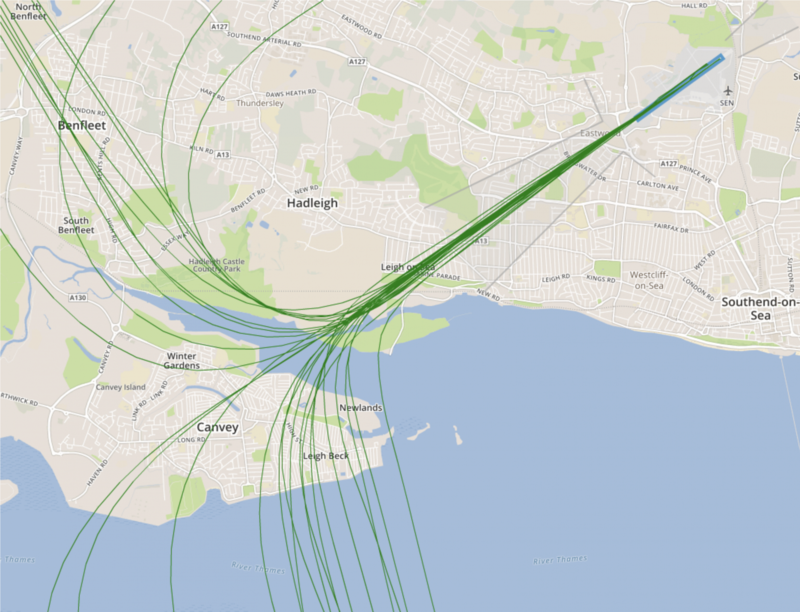 Enquiries and complaints from the local community help us to understand how different locations around the airport are impacted by Southend Airport aircraft movements. Making a noise complaint is not an effective way of stopping aircraft operations, changing the flight paths or agreed operational controls. Southend Airport has a comprehensive noise complaints handling service which responds to comments and complaints about aircraft noise and routing. Following feedback from the local community, improvements were made to this service in 2012. A new digital submission form was introduced on the airport website to make feeding back to us easier and also to ensure that all of the data required to investigate a specific incident is captured. This new system also enables us to keep an accurate record of all the complaints submitted to us. However, for those without access to a computer, noise complaints can also be made in writing. The airport aims to investigate and respond to complaints within seven working days. Using a noise and track keeping system London Southend Airport is able to log and record all complaints individually and then fully investigate specific flights. The system records aircraft data as well as a summary of the response provided. Using the airport’s Noisedesk system. 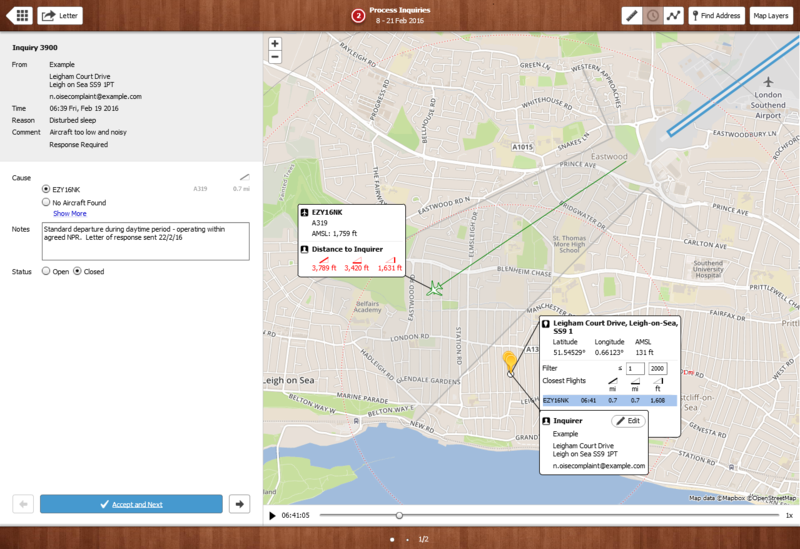 By entering data provided by the complainant via the online submission form, Noisedesk then automatically detects the closest flights to the person’s location at the time of the disturbance. If a complainant is dissatisfied with the airport’s response in relation to a noise matter, the relating correspondence may be referred to the Airport Consultative Committee (ACC) for further consideration. All noise complaints are regularly reviewed by the ACC. The number of noise complaints received is reported in the Annual Report. The information is reviewed, analysed and presented to the Southend Airport Consultative Committee. It is important for us to listen and engage with local communities in order to understand how our operations affect our neighbours, and make positive changes where possible and practicable. Where can I find out about your Property Acquisition & Sound and Thermal Insulation Grant Scheme? • Sound and Thermal Insulation Grant Scheme – for properties that fall within the 63dB LAeq 16 hr noise contour* [See below for details of the scheme) *LAeq 16 hour is the standard way of measuring aircraft noise around airports and is the measurement the airport is required to use under the Section 106 Planning Agreement. It is the ‘equivalent continuous sound level’, i.e. the average sound level calculated over a defined measurement period. In the UK, LAeq noise contours are produced for the average summer day, where ‘summer’ is defined as the 92–day period from 16 June to 15 September and ‘day’ is defined as the 16–hour period 0700–2300 (GMT). More information on how noise around airports is monitored. If your property falls within the 63dB LAeq 16 hr noise contours you will automatically be contacted by the airport and invited to apply for your property to be insulated under our Sound and Thermal Insulation Grant Scheme. The airport will offer to sound insulate up to two living rooms and all bedrooms up to a maximum of habitable rooms (i.e. not including bathrooms, conservatories, hallways or kitchens (unless used as a dining area)) in total under the scheme. A landing may be included instead of another room. Where a kitchen and living room are in the same room or where an external door opens immediately into a habitable room then these rooms will be eligible for the Sound and Insulation Grants Scheme. As the homeowner you may add rooms or upgrades to the white PVC-U windows offered within the scheme at your own cost. Free mechanical ventilators will be offered with either option, where required. Where secondary sound insulation or double glazing is fitted to a window facing south and this gives rise to solar gain an additional sum of up to £150 (Index Linked from June 2012 incl. vat) will be paid for solar shading measures. In addition, we will offer to install loft insulation of a type to at least 270mm to improve the sound attenuation of any qualifying properties. The work will be carried out by a glazing contractor appointed by the airport and will be guaranteed for a minimum of 5 years against defective workmanship or materials. Qualifying properties shall only be entitled to one grant and once installed any sound insulation (glazing or loft insulation) shall become the responsibility of the property owner/occupier. You may not wish to take up this offer at the current time; however, you will remain eligible for the scheme for a period of 10 years from the date of the property’s first inclusion in the Sound and Thermal Insulation Grants Scheme i.e. qualifying as within the 63dB LAeq 16hr noise contour. The latest noise contour maps are published in the Annual Report. The noise contours are reviewed every two years and all qualifying properties falling within the contours will be notified if they qualify for the Property Acquisition or Sound and Thermal Insulation Grant Scheme. I live under the flightpath, close to the airport and I think the tiles on my roof have been damaged by aircraft coming into land, can the airport pay for the damage? In accordance with its S106 Planning Agreement, London Southend Airport offers a Wake Vortex Compensation/Repair Scheme; This scheme covers any residential property, including residential properties above commercial premises (eg. flats above shops). Wake Vortices are turbulence in the air formed behind an aircraft, particularly when landing. Many of the new aircraft operating at London Southend Airport such as the Airbus A319 and Embraer 170/190 are equipped with winglets. These winglets improve aerodynamics and reduce the intensity of the wake vortices and reduce the likelihood of a wake turbulence impacts. Wake turbulence damage is usually verified by its pattern of damage. Only traditional slate or tiled roofs can be damaged and this damage is usually in the centre of the roof. The legal liability for damage caused by wake vortex is with the aircraft operator but, because of the difficulty in establishing which aircraft may have caused the damage, the Airport provides a scheme to ensure that damage is repaired. If you think your property has been affected by wake vortices, please contact us via our Compliments and Complaints form as soon as any damage caused by wake turbulence is noticed. When a complaint of damage to property caused by wake turbulence is received the Airport will, within 15 days, investigate the extent (if any) to which the damage has been caused by wake turbulence. If it is established that damage has been caused by wake turbulence, then the property owner or occupier will be able to choose either to have the damage remedied by the Airport directly within six weeks of the date of the complaint or to have the sum representing the estimated cost to the Airport of undertaking remedial works itself paid by the Airport to the property owner or occupier. How can I make a claim for devaluation of my property due to the airport development? Please visit our compensation page. Will there be any changes to how air traffic is managed in the future? The Air Traffic Control team at London Southend Airport constantly review procedures, airspace requirements and developments in the industry, to allow the air traffic service to be improved and to maintain our excellent safety performance. Recently we consulted on changes to departure and arrival routes that will take advantage of performance-based navigation technology in use by most aircraft operators at London Southend Airport. We expect that these changes will be implemented by the beginning of 2020. Further information can be found on our webpage. London Southend Airport is also a stakeholder in the development of the wider UK Airspace Modernisation Strategy that is being sponsored by the Department for Transport and developed by the CAA. This will see a once in a lifetime opportunity to modernise airspace, in particular in the SE region of the UK, that has not had any significant changes for the last 50 years. London Southend Airport have filed an Airspace Change Proposal to support this strategy. More general information about this can be found via The sky's the limit website, but London Southend Airport will continue to engage with the local community groups as the strategy is further developed. I live close to the airport and have seen someone flying a drone close to overhead aircraft. Is this dangerous, what should I do? Operators of drones should fly in accordance with the Air Navigation Order, which is summarised in the Drone Code. Commercial operators may have further permissions from the Civil Aviation Authority that allows them to operate in a different way - for example above 400 feet. They will also be in contact with Air Traffic Control to ensure that their flight can be co-ordinated with the airport operation. If you believe that a drone is not being flown in accordance with the law, then you should contact the local police. If you would like to operate a drone in either the Flight Restricted Zone (FRZ), the Runway Protected Zone (RPZ) or in controlled airspace surrounding Southend Airport, then please contact Southend ATC through the enquiries e-mail.